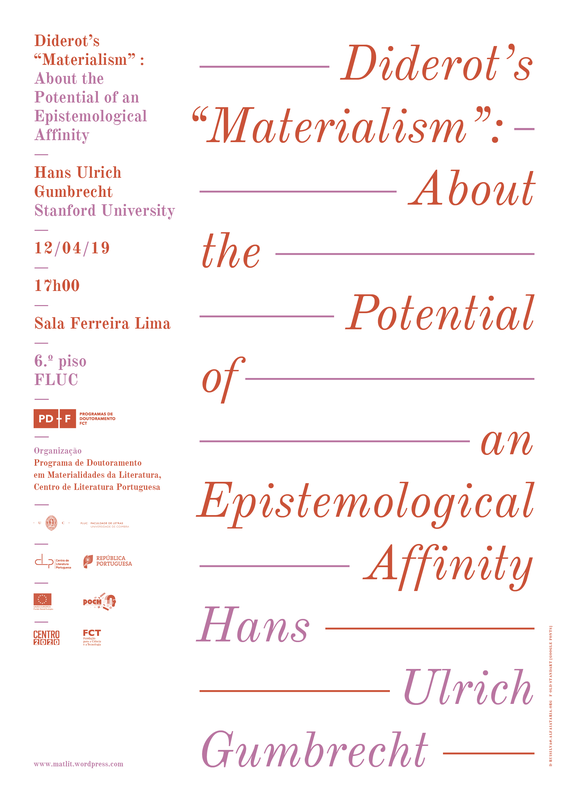 No próximo dia 12 de abril de 2019, pelas 17h00, na Sala Ferreira Lima (6º piso, FLUC), terá lugar uma conferência por Hans Ulrich Gumbrecht (Universidade de Stanford) intitulada “Diderot’s “Materialism”: About the Potential of an Epistemological Affinity”. Organização do Programa de Doutoramento FCT em Materialidades da Literatura com o apoio do Centro de Literatura Portuguesa. The lecture emerges from a recently finished book manuscript that tries to reconstruct an epistemological outline in the late 18th century which, on the one hand, seems remote from present-day knowledge and concerns (especially in its quest for “materialism”) but which, on the other hand, may offer certain perspectives that may inspire (rather than “define”) present-day intellectual trajectories. After 1945 – Latency as Origin of the Present. Stanford, CA: Stanford University Press, 2013. Atmosphere, Mood, Stimmung. Stanford, CA: Stanford University Press, 2012. [Review by Matheus de Brito in MATLIT 2.1 (2014): 185-189].